Burdock is a herb that is often used for medicinal purposes. It is able to help with many different ailments. There are 11 species of burdock, of which 6 species grows on the territory of Russia. Most common in folk medicine is burdock. In folk medicine for different recipes use almost all parts of burdock in processed and fresh. The plant has many medicinal properties and is used as antibacterial, antifungal, diaphoretic, choleretic, diuretic and healing agent. At stones in the bladder and kidneys, stomach ulcers, gastritis used burdock root tincture. For its preparation you need to take one teaspoon of crushed root and Bay 0.5 liters of boiling water, to insist during the night. Do it best wrapped in a thermos. This infusion should be consumed hot, drinking the entire cooked batch in a day. The juice of burdock is an effective remedy for the treatment of liver diseases, all kinds of hepatitis and other diseases. 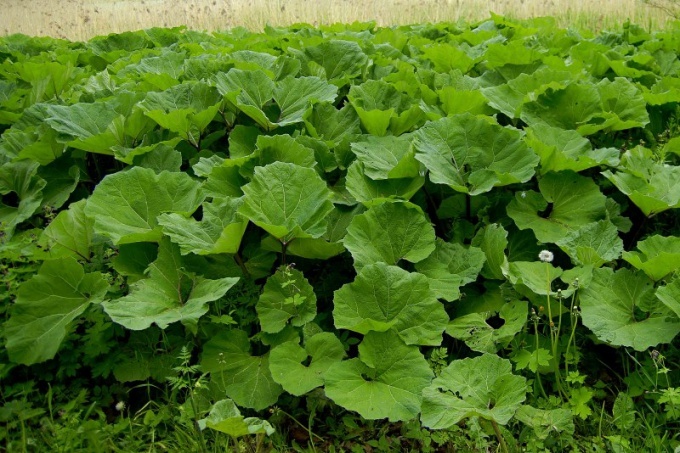 In the spring the juice from the leaves of burdock is especially useful. For its preparation is enough to pass the leaves through a meat grinder, thus squeezing out the juice. It is necessary to warn that it will taste very unpleasant. To drink it should before eating one tablespoon. After one week of this treatment should take a week break, after which making juice can continue. It is recommended to conduct several courses. In the treatment of rheumatism are very effective decoction of burdock root. To prepare the broth you will need one teaspoon of crushed root per Cup of water. The amount of water should boil, and then add the chopped burdock root. The resulting mixture is thoroughly mixed and infused for half an hour. Drink this decoction, you need one teaspoon before meals. From the juice of burdock root can be made a very useful ointment to help with the huge amount of different diseases of the joints. In order to prepare this cream, you should mix the juice of burdock root with a vegetable oil in the ratio of 2 to 1. Mix thoroughly, place the tool in the refrigerator. It has not lost its beneficial properties, not store it for long periods of time. For this reason, it is better to prepare only small portions. Another effective remedy for treating the joints is a powder from burdock root. To make it simple enough to take the burdock root and finely Smolov it, put the hours under the sun. Store this powder is recommended in a dark glass vessel. Take three times a day for a third of a teaspoon at a time, while drinking a half glass of water.